Grill ribs over indirect* medium (about 350 degrees F.) heat for 1 hour. Combine sauce ingredients in mini-chopper or food processor. Process until nearly smooth; reserve half of sauce to serve with finished ribs. 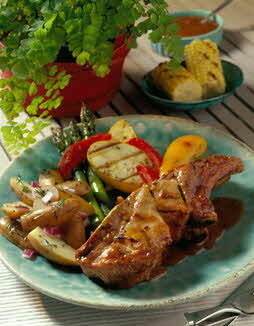 Brush remaining sauce on ribs; grill for an additional 30 minutes, until ribs are tender and meat pulls from the bone. Heat reserved sauce and serve with ribs. *To grill with indirect heat, bank hot coals on one side or in a ring around the perimeter of the fire grate. For gas grills, pre-heat and then turn off any burners directly below where the food will go. Place ribs on the grill so they are not directly over any coals or gas burners and close grill hood. Serve these Asian-inspired ribs with steamed fresh asparagus and Ginger Garlic Bread.